This guide can explain the sequence of operations in SprutCAM. This work order is applicable to all types of operations, but in this manual we assume a milling operation. In the follow of this manual will be further elaborates on other operations, such as turning and cutting 2D. We will then elaborate on 3, 4 and 5-axis milling, as well as indexed simultaneously. CAD models that you want to use in SprutCAM saves in the 'models' folder. The first step in making of a CAM project is to import the model. If you have clicked to open the solids and all faces, surfaces and curves are loaded into SprutCAM. After the CAD model was imported, it is possible that it has wrong position, or you want to scale it or make extra copies. That can be done by clicking on the 'Transform', the window 'Spatial transformations’ will open. Make sure that selected part in the feature tree, is highlighted by blue. The following illustration shows how the workpiece can be rotated. It often happens that a model hindsight is drawn in the wrong plane. That’s not a problem in SprutCAM, you can correct it by few clicks until the model is in right position. The workpiece is now in the desired position, and the workpiece zero is determined. Now, the workpiece must still be placed in the correct position on the machine, and the starting material still needs to be defined. For this, we must open machine library and choose the machine that we want to work with. SprutCAM machine library includes a number of machines. There are machines without visible scheme, these are universal ones. However, it’s desirable to have a scheme in a number of situations. For example, in case of 4 - 5-axis machine or robot. But it is also possible that, for example, uses a complex fixture on a conventional 3-axis machine. It is very important that you can use SprutCAM collision control, and that is why you need a scheme of your machine. You can make such scheme in our Machine Maker program (for machines only, not for robots). Or you can contact your supplier to make one for you. Selected machine appears on the screen with the workpiece. But as you can see the workpiece is not in the correct position. There are two ways of material characterization. As in the first image you have several choices. But you can also import the raw material as you import the model, see second image. This may be necessary if you have a semi-finished product as a starting material, for example casting. Now it is all ready to create machining strategies. Go to vertical machining tab and click “New”. The operation has now been left in the feature tree, you can try to set the operation parameters. At job assignment you can choose what you want to edit. For example, this can be a certain area, flat or line. If you omit here, SprutCAM will edit automatically by itself, using the model and material that you defined. There are two ways of customizing operation after the toolpath simulation. You can open the operation as described above, double-click on the operation and change the values in the operation parameters. But there is also a faster way to do this, as described below. 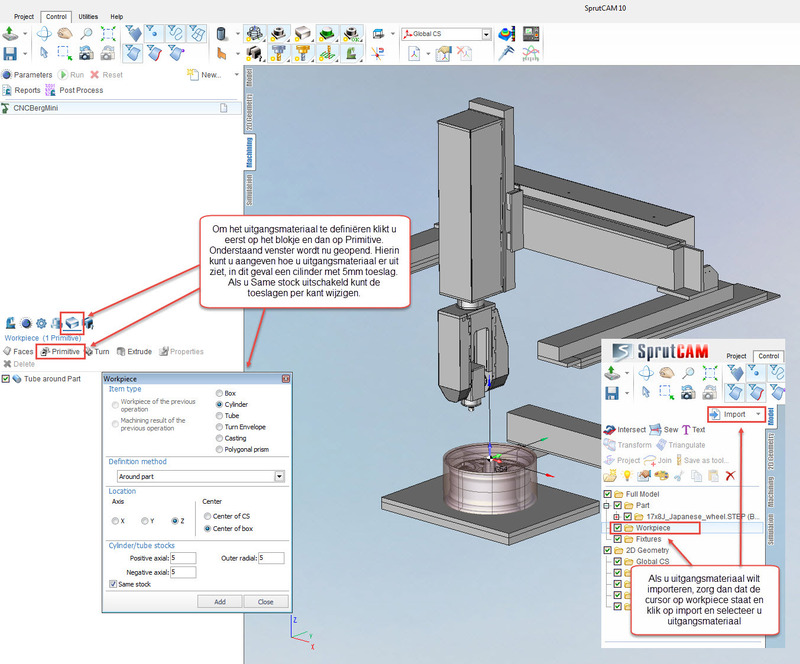 The procedure described above is the standard method of creating a project in SprutCAM. It is obvious that every operation does not have the same number or the same parameters, but the method is the same for each operation. But there are many more opportunities to optimize a project, or affect. In the sequel to this manual, we focus on the various operations. We also highlight the work with different machines such as turning, 2D cutting, 3, 4, 5-axis milling. There’ll be another manual for SprutCAM Robot.